So Saturday was an amazing day. You guys who follow me on instagram will have already seen the brilliant day I had but for those of you who don't (firstly why not my insta is amazing lol) and secondly I met up with some amazing PS bloggers and I can honestly say they are some of the nicest women I have ever met. I have linked their blogs with their names so check them out they are brilliant. 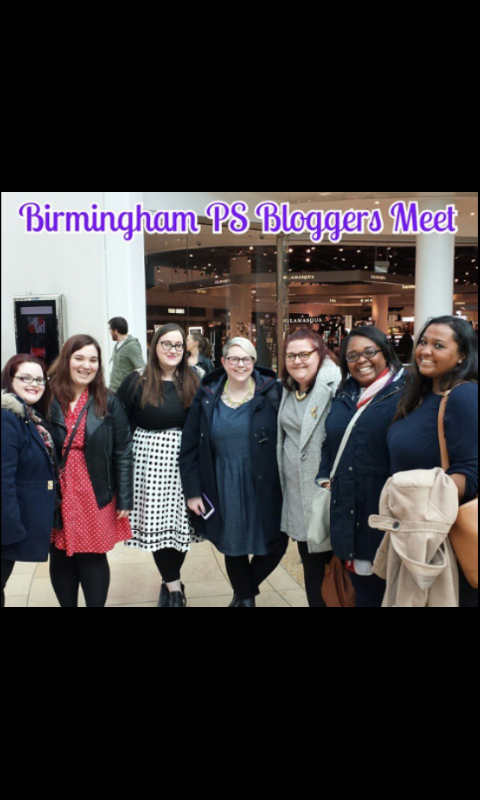 It all started a few weeks ago when Nikki organised a meet up in Birmingham. I'm not gonna lie I was very scared, my blog is still a baby and these girls have been blogging for so long. I was worried they would know each other and I would feel a bit out of place. So when I found out that Kat was going who I have been talking to on instagram (she is totally amazing and beautiful both inside and out) I felt a bit better knowing someone else going. Saturday came and I had organised to meet a few of the girls at the train station as they were not sure where to go. A couple had a problem with there trains so in the end I met up with Steph who is totally lovely and so sweet and Kat. We then walked to the Bullring Shopping center and met up with Natalie who is such a laugh and always has the most amazing smile. 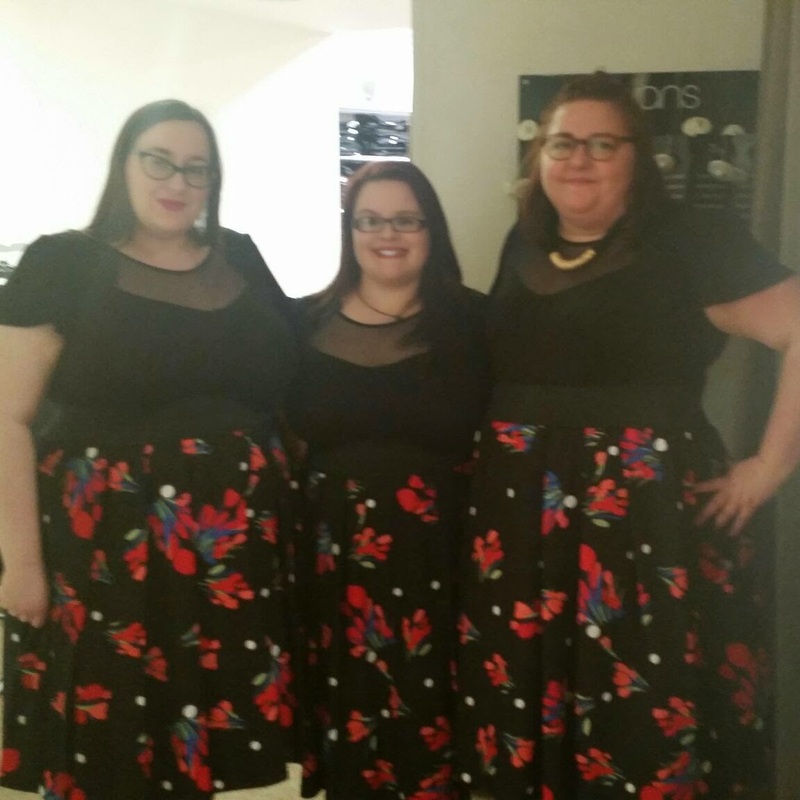 We went for a coffee and waited for Nikki, then met Patty one of the most friendliest people I have ever met and Becky my new fountain of knowledge when it comes to make up (keep reading you'll understand) and the shopping began. Our first stop was Yours, they have some amazing stuff in this season and I think my next post is going to be a season wish list hehe. 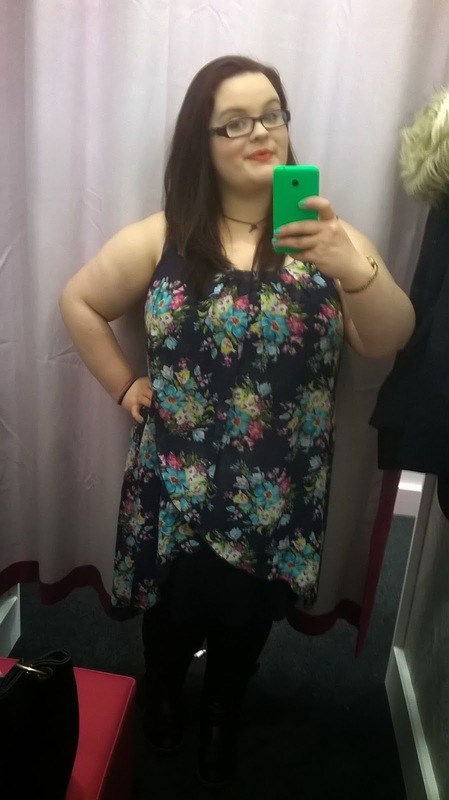 I found this gorgeous tunic at the back of the store, it has a under layer which is navy blue and flower print on top, I loved it but I couldn't justify paying £30 for something I cant wear for a few months so maybe when it get a little warmer I'll buy it because it is so nice. After some lunch (because you need shopping fuel) we all went down to Evans and this is where the fun began, I sort of felt sorry for the assistant becasue we sort of took over the top floor changing rooms (but in our defence there was seven of us lol). As soon as we walked towards the shop we saw a sign for a one day sale, woop woop talk about timing. We walked in and then we all fell in love with the same pair of jeans. So for me jeans are never a good thing, I am really short and I am a large girl and I can never find a pair of jeans that fit me both on my tummy and on my leg length, but know all I can say is THANK YOU EVANS, the jeans are amazing they are stretchy, they are fitting they are skinny jeans, which to tell the truth I never thought I would be able to get away with, and they fit my leg length HALLELUJAH!!!!! 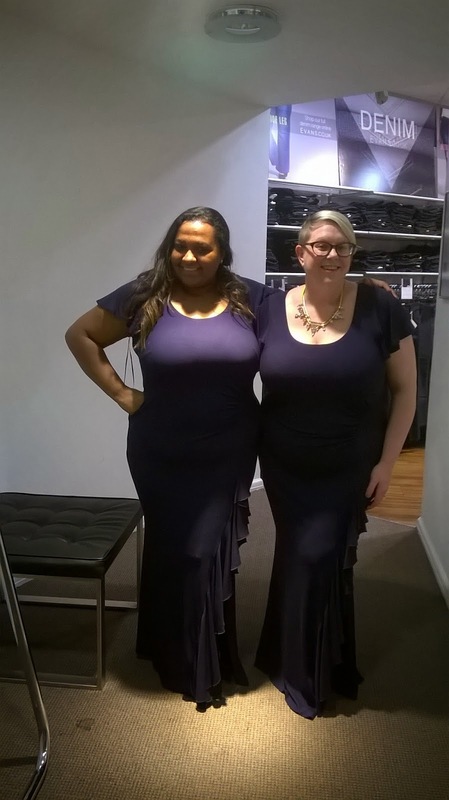 We also went over the the Scarlett and Jo section of the store and we all decided to pick a dress to where, this is then what happened. I have seen this dress reviewed by so many bloggers and I must admit it is such an amazing comfy dress. 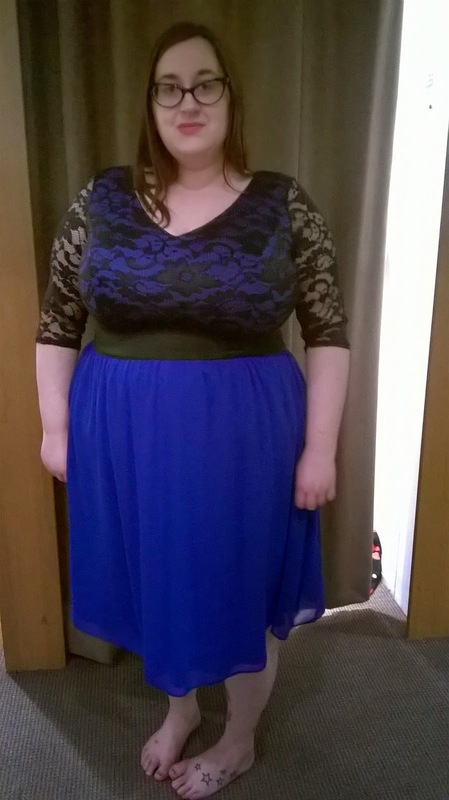 Normally I am a size 18-20 (uk size's) but this is a size 16 and fit me really well. 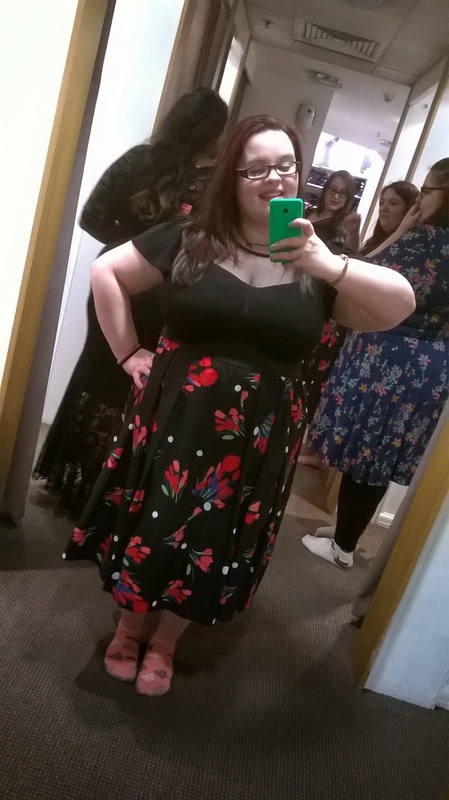 For me personally, being a shortie, I feel it is a bit too long for me, so I didn't buy it, it is £65 and I couldn't justify getting it and then paying for the dress to be altered to make it a little shorter, but it is a gorgeous comfy dress, and I do love it. I love that last pic it really shows how short I am haha. So as you can tell we really did have such a fun time in Evans, and we all bought those pairs of jeans because we all loved them so much, I will be test driving those babies this weekend so I will let you all know what I think. After this we went to New Look, this trip did disappoint me, the Inspire range is only in one of the two New Look stores in Birmingham and they don't carry a lot of clothes, I did try on a jumper but it just did not sit right on me, and it felt clingy, this is the link the jumper I tried on. Nikki sadly wasn't very well on this trip so she had to go home after this (hope your feeling better now hunny) and then I became the tour guide since I was the only brummie left. Becky and Kat then took me on my first MAC trip. I am very much a bargain girl but I do want to branch out when I can to high end make up, so when we got there Becky talked me though the products telling me about the lipsticks and the different products they have and I really do thank her for it, she taught me a lot and I am hoping to be branching out soon and comparing the high end to high street so keep our eyes peeled. 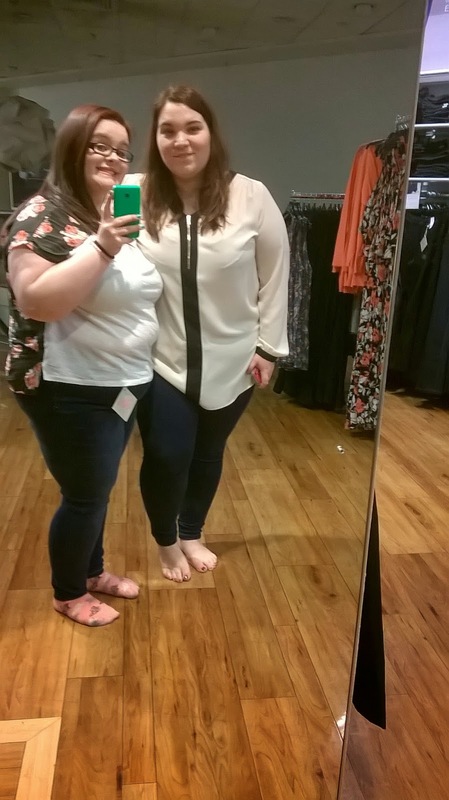 By the end of the day I had learnt so much, bought a new pair of jeans and met a group of amazing girls who I will now class as my friends, I felt comfortable as soon as I met them and there was no judgement or anything just girls shopping having fun and learning new things about make up. Fab post and it was lovely to meet you. PS Shopping days are so much fun. Hopefully there will be more of them.